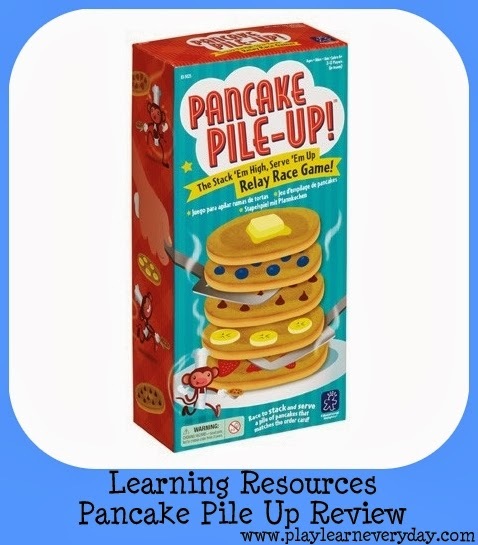 In preparation for Pancake Tuesday next week, we're reviewing a fun game from Learning Resources called Pancake Pile-Up! It's aimed at children from age 4-8 and from 2 or more players (it can be played in teams) and it costs £14.95 to buy from their website. There are cards with a sequence of pancakes and the players have to stack up their pancakes with the different toppings in the same order as the ones on the card. 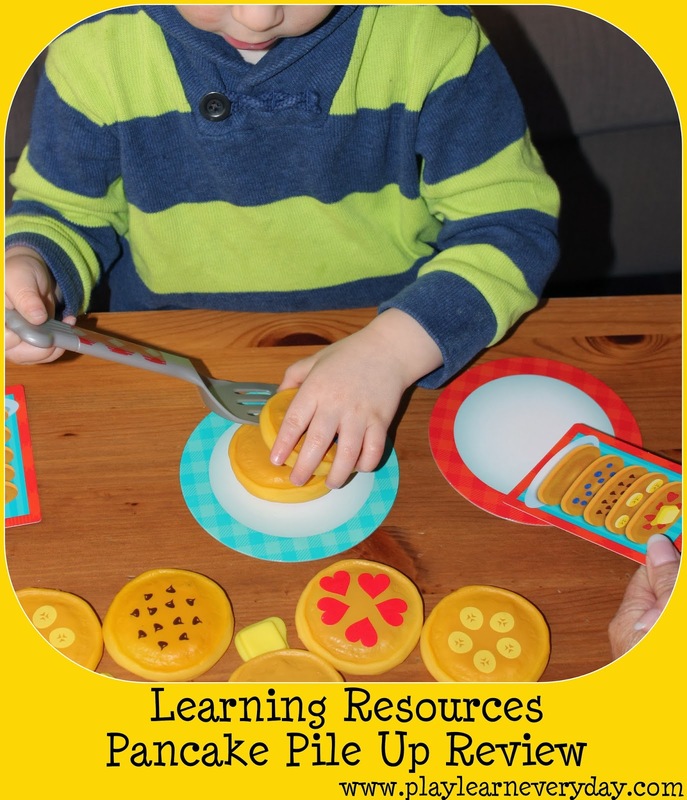 It's a great activity for matching as a part of Problem Solving, Reasoning and Numeracy development as well as fine motor control in balancing the pancakes on the spatula as part of Physical Development. As Ethan is a bit young, we started by just going through how the game works and letting him follow along with a card and make a stack of pancakes. He enjoyed just matching the pancakes to the pattern on the card and using the spatula to lift them. There are also pictures of the pancakes on the bottom of the box, which acts as a 'griddle pan' with full size pictures of the pancakes that they can be matched up with. This was also a good activity for Ethan as he could clearly see the pancakes to pair up. It is a really fun game to play and can be used in a variety of ways for matching activities. Ethan had a lot of fun with it. The pancakes and spatulas are also lovely as other toys, they fit in Ethan's toy frying pans, so we also played at making pancakes for pancake day and thinking of other toppings that we could put on them. A great way to prepare for pancake day, now we can't wait to make the real things!